Also available with customised dimensions. Safety is key when it comes to lifting sheet metal stacks, plates etc. The GHW fork hook ticks all the boxes: It makes a great partner for Connex and welded systems and is available in customised dimensions upon request. In addition, it comes with CE-marking, complies with EN 1677‑1 and has the mechanical values of G10. Tip loading must be avoided and care must be taken to ensure that the hooks are fully pushed onto the load. 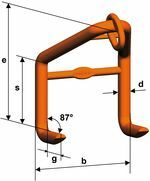 The hooks must always be used in pairs, with a sling inclination angle of 30° to 45°. For details, please refer to the full operating manual. Custom designs are available upon request!